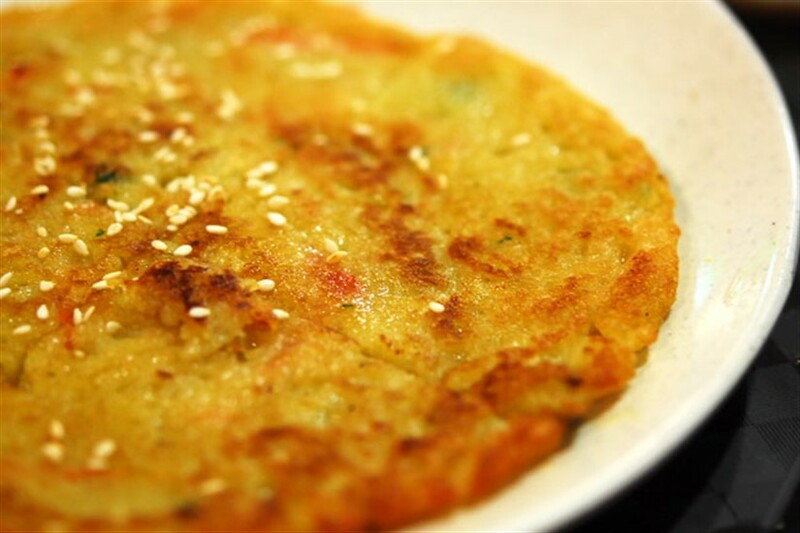 Gamja-jeon is one of many varieties of Korean style pancakes, broadly termed as jeon. 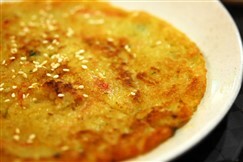 With potatoes as its main ingredient, gamja-jeon is made by pan frying grated potatoes in oil. 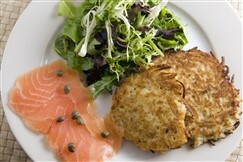 This process is much like western style hash browns, and the end result does have some similarities to the popular breakfast food. However, there are some major differences that make gamja-jeon a uniquely Korean dish. Potatoes were introduced to Korea in 1824, and to this day are mainly grown in the Gangwon Province. 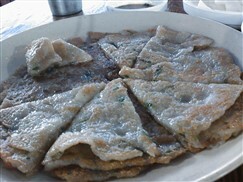 As a result, gamja-jeon has become somewhat a specialty of the Gangwon region. The traditional version of gamja-jeon is made with only salt,oil, and potatoes- much like hash browns. Often, additional ingredients such as scallions, mushrooms, chives, and carrots are added to the pancake. This gives it additional color and texture. As with many other Korean dishes, gamja-jeon is served with dipping sauce; in this case, a salty side called choganjang. Choganjang is a simple condiment, made from soy sauce and vinegar. My least favorite jeon, and I still love it! 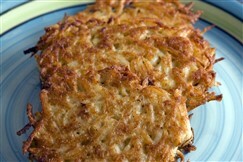 My first year in Korea, I used some gamjajeon from a local restaurant as a stand in for latkes during chanukah. It's good when the potato is in small pieces, not used as a flour, as it gets a little gummy.